Album Vilmorin, Les Plantes Potageres, Paris (Vilmorin-Andrieux & Cie.) 1850-1895. Paris, Museum National d'Histoire Natur. I often wonder if the famous idiom about children being seen and not heard also applied to vegetables in the early 20th century. While Country House owners, like Downton Abbey‘s Crawley family, could pride themselves on serving fresh produce grown from their own gardens, no vegetable on their dining room table went uncooked, sometimes beyond recognition. It is unlikely they realized most of the nutritional benefits were lost when boiling, but it would appear that fashion was an important consideration, and that soft textures were a more gentlemanly way to eat veggies, so as not to distract from conversation around the dining table. 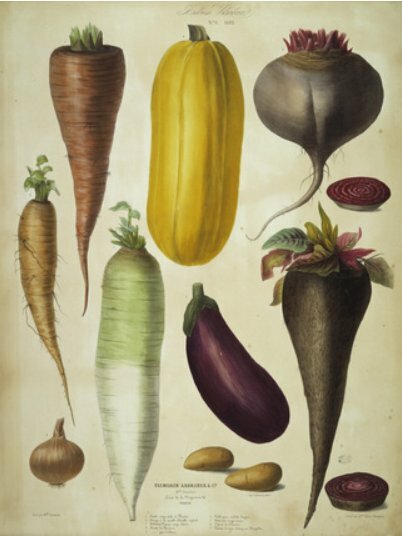 Shaving, mashing and reshaping vegetables into interesting shapes was a favorite treatment for Victorian cooks, a tradition passed along to Edwardians/early 20th century cooks. April 14th marks the 100th anniversary of the sinking of Titanic and you may have noticed more articles and documentaries appearing in the media about the tragedy at sea. James Cameron’s Titanic is being released in 3D, and Julian Fellowe’s Titanic 2012 TV mini-series is currently airing weekly episodes in Canada and the UK, to be shown in the US on April 14 and 15th. Exploring the foods served on board has been occupying some of my time during the Downton Abbey off season. Afterall, these same foods would have likely been cooked in Mrs. Patmore’s kitchen. I had set a goal for myself in January to cook my way through the “last dinner” menus and dishes served in 1st, 2nd and 3rd class (steerage) on Titanic. Each menu on my blog has hyperlinks to dishes prepared elsewhere. I haven’t done too badly in working my way through the list, although to think that the kitchen staff onboard Titanic had to prepare all these meals all at once is mind boggling. With the finishing line in site, I thought today we would bundle up the remaining vegetable dishes in one fell swoop. 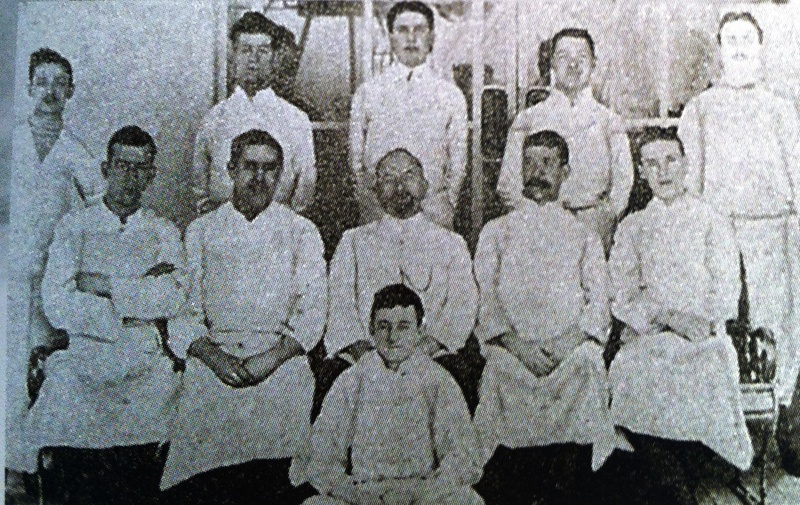 Cookery was very specialized in the early 20th century. Some cooks did nothing more than prepare vegetable dishes. On Titanic an army of cooks and assistants worked non-stop to prepare at least 2000 meals a day. The vegetable cooks worked alongside other specialists: sauce cooks, roast cooks, bakers, pastry cooks, fish cooks, soup cooks, dessert cooks. There was even a Hebrew cook to prepare kosher meals for Jewish passengers. Titanic boasted the most modern kitchen equipment of the time and abundant supplies were loaded to serve both passengers and crew: 60 tons of meat and fish products; 50 tons of fruits and vegetables; 5 tons of cereals and 40,000 eggs. If you are in the final stages of planning a great Titanic Tribute feast, the thing to remember about Edwardian cooking is that they cooked their vegetables until soft. This was served as part of the Fifth Course in 1st Class, alongside lamb, duck and sirloin beef. Timbales are custard-like dishes of cheese, chicken, fish, or vegetables baked in a drum-shaped mold. This classic french vegetable dish is a delicious grown up way to eat mushed up veggies. The pea molds can be prepared earlier in the day, kept at room temperature and heated through before unmolding and serving. In large saucepan of boiling water, dissolve all but 1/4 teaspoon of the salt. Add peas and blanch for 2 minutes. Drain and rinse under cold water until chilled through; drain well. 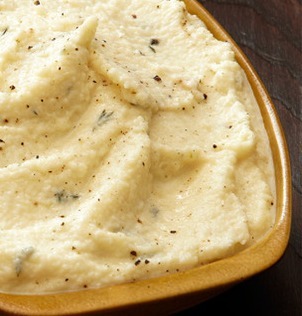 Place peas, mint sugar, remaining salt, and pepper in blender or food processor; puree until very smooth. With motor running, add egg whites one at a time; pour in your dairy product and blend until well combined. Divide pea mixture among 6 greased 1/2 cup ramekins or custard cups lined with parchment rounds. Place ramekins in baking pan; pour in enough boiling water to come halfway up sides of dishes. Cover with foil and using sharp knife, make vent holes at random intervals. Bake in 350° F/180°C/Gas Mark 4 oven for about 30 minutes or until tester inserted into enter of timbale comes out clean. Let rest for 2 or 3 minutes; run knife around edge of each dish and turn timbales out onto warmed plates. Garnish with a sprig of mint and a dollop of your favorite thick dairy product. This dish was also served to accompany the meat dishes served as part of the Fifth Course in 1st Class. Mrs. Beeton, the great Victorian cookbook diva, was rumored to have advised that “you should cook carrots no less than 90 minutes”. If you are planning your own Titanic dinner, you may wish to concede to our more modern tastes and cook the carrots only until easily pierced by a fork. 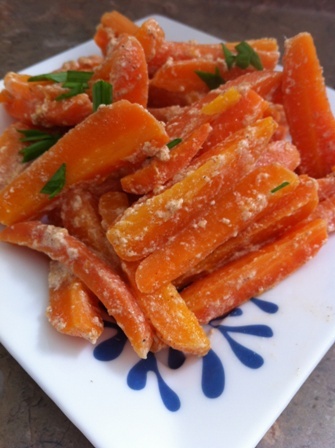 Place carrots in medium pan with enough water to cover; add cinnamon stick. Bring to a boil, reduce heat to medium-high, and cook for 6 to 8 minutes or until carrots are fork-tender. Drain, remove cinnamon stick, and return carrots to pan. Add butter, salt, ground cinnamon, nutmeg, and pepper; mix well. Add lemon juice and cream; boil for 1 minute or until cream is slightly thickened. Adjust seasoning if necessary. Turn into shallow serving bowl; sprinkle with chives and serve. The final vegetable dish served as part of the Fifth course in 1st Class we will prepare today is Parmentier Potatoes. Antoine-Augustin Parmentier (August 12, 1737 – December 13, 1813) is best remembered for elevating the lowly potato from the hog trough to dining table in France and around Europe. Outside of Ireland potatoes were primarily fed to animals and were actually thought to cause leprosy and other ailments. Traditional parmentier potatoes are pan fried in a cup of butter, then finished in the oven. My version is much healthier. It is quick to prepare and kids love it. 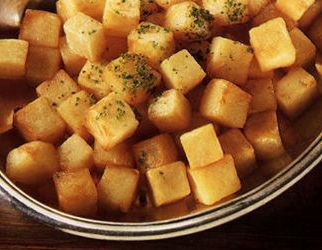 Peel the potatoes, trim the sides to make a rough rectangle, then cut in to even sized, medium dices – approx 1 inch. Season and spread out on a greased baking dish. Bake in a 400° F/200° C/Gas Mark 6 for 25-35 minutes until golden brown, shaking occasionally to prevent sticking. Turnips were a popular dish in Britain and Continental Europe. This dish was served as a side dish in 2nd Class. Peel turnips and cut into chunks; place in a large saucepan. Cover with cold water and bring to a boil; reduce heat and simmer for 25 to 30 minutes or until fork-tender. Drain well and transfer to food processor; add butter, honey, and cardamom; process until smooth. With motor running, gradually pour in heated milk, salt and pepper. Continue to process until turnips are light and creamy. * You can easily substitute whipping cream with more health conscious alternatives which won’t sacrifice taste: unsweetened soy milk, fat free half and half, non fat evaporated milk. When we were in Morocco last fall, it struck me that they too cooked their vegetables (everything for that matter) to death, even salads were cooked to a mushy paste! But historically they likely had to to cook the bacteria and germs out of them! I remember organizing a medieval conference in university and I worked with a catering company to recreate a medieval meal; they used spices to mask the flavours and odors of rotting veg and meat! I bet the CFIA FDA would have a field day with that today! 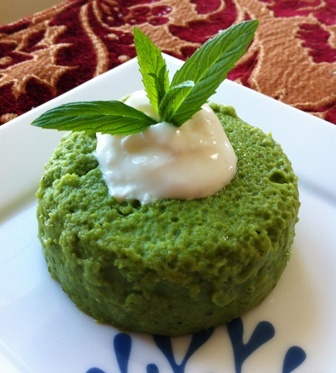 I regret to let you know that I tried your recipe for “Minted Green Pea Timbales” and it was a catastrophe, horrible, tasted terrible! They looked gorgeous, but nobody was able to eat them and I scooped them out to the kitchen as quick as possible. What a fiasco!!! !